At 1:30 p.m., on March 22, 1944, army 2nd Lt. Leeroy Halverson (Spelled with two e’s.) 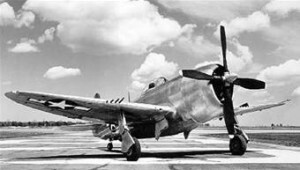 took off from Bradley Field for a routine training flight in a P-47D Thunderbolt, (Ser. No. 42-8264). About an hour later, as he was making his approach for landing, his aircraft crashed at the beginning of the runway and he was killed. Lt. Halverson was assigned to the 1st Fighter Squadron, First Air Force. He’d received his pilot’s rating on February 8, 1944. Lt. Halverson is buried in Union Cemetery in Milwaukee, Wisconsin. To see a photo of his grave go to www.findagrave.com, memorial #126963224.